We have been lucky with the deep water, lack of algae and perfect temperature of Rakaca Lake this year, getting in maybe a swim a week for most of the summer. Last week was probably the last swim, since the temperature of the lake has reached my lower comfort zone. Coming back from the swim, I noticed that the clothes put out on the line to dry had already been taken in...or...it turns out our lovely neighbours jumped our wall and stole an entire wash off our line. Even though "everyone knows" who stole our clothes, we have not been able to get them back. I do not even want to think what someone is doing with our underwear. The police nabbed the culprits a couple weeks later, 2 boys aged 15 and 17. Rather than return the clothes they burned them. Insurance company Aegon refuses to compensate us because the clothes were left outside to dry. So, we were in need of some cheering up when we went to the L'Hullier-Coburg Castle in Edelény for a classical music concert and wine tasting in the back garden embraced by the arms of the castle's wings. The wine tasting took place in the castle's coffee shop, and featured wines from the Heted Hét Vineyard near Miskolc. I was already a fan of the vineyard's 2014 "Regős" Kövidinka wine after tasting it at the Diosgyőr Castle Festival a couple years ago, so was eager to sample some other offerings from the same vineyard. The 2016 "Tündérszép" Leánka-Ottonel Muskotaly fizzy white wine was determined to be sour by everyone at the table. On the opposite end of the scale was the "Regős," which all agreed was an excellent wine. The third wine was the 2016 "Csodaszép," a kékfrankos-cabernet sauv. cuvee bubbly rosé, which was forgettable. Luckily, the last wine, the 2011"Csizió"Kadarka was a fine wine to end on. Before heading to the concert I inquired about prices and was told by the owner that the Regős was 1800/bottle and the Kadarka was 2500/bottle. However, when Jeroen went to buy some Regős after the concert he was charged 2000/bottle - I do not know what is up with that. 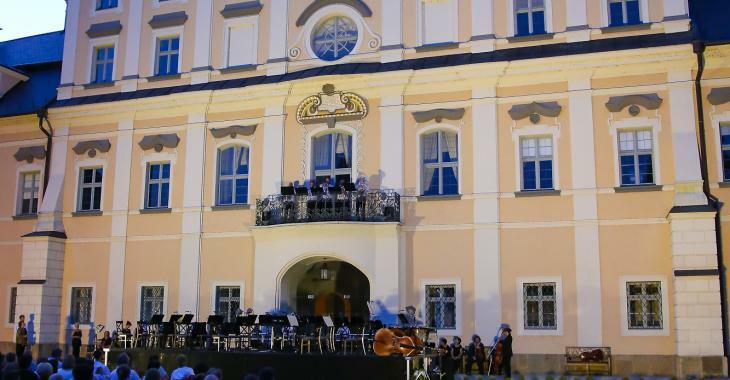 The Miskolc Symphony Orchestra took the stage at 19:00. The setting was charming and even a bit awe inspiring, and the weather was both cooperative and perfect. The concert opened with a brass fanfare featuring French horns on the balcony above the stage. The other pieces included something from Hübler, also for the French horn, and Haydn's 45th Symphony, known as his "Farewell Symphony" (the only 18th century symphony written in F♯ minor). The orchestra left the stage by ones and twos until only two violinists remained on the stage and closed out the concert. The concert was only 1000 huf, and the wine tasting an extra 500. I do not know why they do not organise a weekly programme at the castle, or why what they do organise is not better advertised. We would be happy to attend such events more often if only we knew about them! We stopped in at the Templomi Kert for a quick pizza on the way home. The place was packed with people having a similar idea, but we still managed to get in and out in about an hour. The next evening we were invited by our friend Norbi to a blues concert in neighbouring Szögliget. We dropped the car off at Simon and Dori's, and then walked over to the cultural house. Five year old Emma informed everyone when asked that we were "going to a blues concert, man!" OK, she did not say "man," but the attitude was implicit. The band, formed 16 years in Szögliget, had not played there since. The soundman had everything turned up so loud in the small hall, that it was almost painful. Even so, the band, Blue Point, were great. I have not seen such a happy, smiley drummer since Greg Ziegler (The Last Drops, Mookie Brando and the Second Cousins, The Poosta Ramblers...). In fact, drummer Abel Mihalik (who until recently also played with Kiscsillag and Kis Pál es a Borz) is the local connection - his parents live in the village. He joined the band when he was 12! Steady László Csizmadia was on bass guitar. Frontman Ákos Angyal was on lead vocals and harmonica. Emma was especially impressed with the harmonica, an instrument she had never properly heard before, and Ákos was happy to show her upon request. Filling out the line-up was talented guitarist Gergely Balázs who was constantly joking with the drummer and thoroughly enjoying himself. Máté Angyal sat in for a couple numbers on bass, and surprised Gergely and himself when he picked up the guitar when Gergely went to the loo. He was all prepared to give the drums a go after that if called upon. If they get together 16 years from now for another reunion concert, or sooner, I would definitely try to see them.